Whew. That’s one heck of a title. Today I am doing a little blog post re-do. See back last summer I had total recipe fail. If you were around back then you may remember This Trifle. A trifle? Yep, that what most of my cake and bread fails turn into, if they taste good but don’t come out of the pan. But I also attempted homemade caramel sauce that turned into caramel whipped cream. Which, don’t get me wrong, was divine. But I’ve been thinking about this bread. Since last summer. I baked it up again. And, since I didn’t want a fail on my hands I used jarred caramel ice cream topping. Since that’s a little runnier than homemade would normally turn out I topped ith with milk chocolate chips and butterscotch chips. Stuck her in the refrigerator and O M G.
Success. 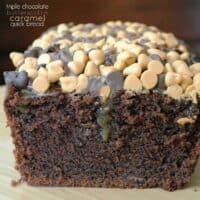 It’s a beautiful sturdy chocolate bread with the most scrumptious topping. Don’t ya think? 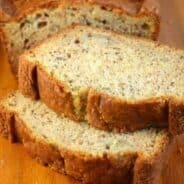 Do you ever go back and re-do old recipes on your blog? Some of my friends did the same thing today. Go check them out at the bottom of this post! In mixing bowl beat butter and sugar until creamy, about 3 minutes. Beat in eggs, one at a time. Beat in vanilla, sour cream and water. Slowly add flour, cocoa, and baking soda. Mix completely. Fold in milk chocolate morsels. Line the bottom of a loaf pan with parchment paper. Use baking spray to grease completely. Pour batter into pan and bake in a 350 degree oven for 60-65 minutes. Allow to cool in loaf pan about 10 minutes. Remove to wire rack and cool COMPLETELY. When cool, spoon caramel sauce on top of loaf. Press chocolate chips and butterscotch chips into the caramel, it helps keep it from dripping down the sides. Refrigerate bread. Slice when ready to serve! Enjoy. This sounds super awesome! Yum! Ohhhhhh man! I sure hope you’re planning on bringing this to my link party this week! It looks AMAZING!!! I’m making this for SURE! Anything that starts with the words – triple chocolate – would definitely be worth trying again (and again). Looks like total dessert heaven! Holy yum! AND, since you called this a “bread,” it’s totally a breakfast food, right?? That bread is CRAZY. Is it wrong I am so tempted to slather it with butter? No–cinnamon butter. And whipped cream. And maybe just a teensy drizzle of caramel sauce but only a teensy one! It looks awesome! oh my goodness I think I just gained ten pounds reading the title – but this sounds fantastic! Oh.Oh.Oh. This looks amazing. No…like I can’t even handle it amazing. I need to make this! LOVE this bread. AMAZING Pic of it! Re-doing recipes…funny I am working on a re-do post right now of my own! hooly bawls. 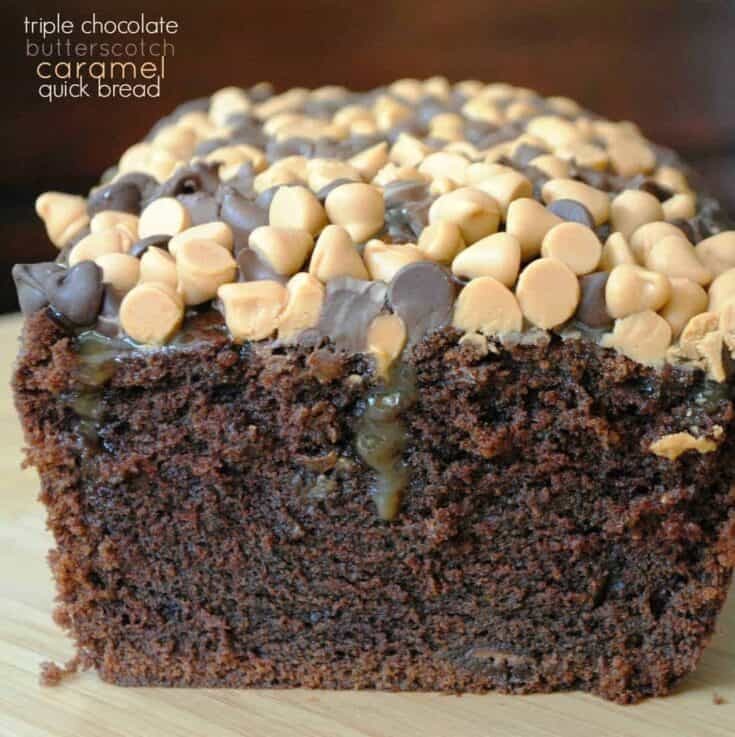 i think i just had a chocolate heartattack, but it’s so so welcomed because i could totally eat that whole loaf of bread!! That picture is the best thing I’ve ever seen. I am craving this!! Mmm def pinning this one for future reference! This looks amazing. I love all of those flavors! 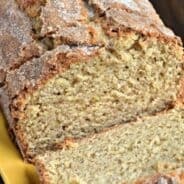 I re-do recipes all the time if I really love them. Hi, Your bread looks absolutely amazing!!! but in your ingredients list, Did you mean in your 1/2 cup of caramel sauce? You have it as ice cream, just thought I’d let you know. Oh woooow….. this looks HEAVENLY!!!! Oh my goodness………..!!!!! This sounds better than chocolate cake! And you are not alone in the need to redo recipes. In fact, I sometimes obsess over a fail until I get it right! Oh my! Oh my my my! This looks incredible! Saw this from Something Swanky’s link party – looks amazing! Pinned so I can come back to it later and try it out :). Thanks for sharing the recipe. Seriously? You’re killin’ me girl! I added this to my desserts page! Good Morning! I wanted to let you know that I featured this fabulous creation on my “What I Bookmarked This Week” post today. Stop by and see! This looks like something my family will devour 🙂 I am pinning it to try! I’m stopping by from Weekend Potluck and am I glad I did. This looks fantastic! Chocolate and caramel topped with butterscotch- can it get much better than that? but still cant find something that chocolaty and can be taken to college with spilling or messing every where!!! I think when I make this I’m subbing peanut butter chips for the butterscotch chips. Can’t wait to make this! Or, you could sub. white chocolate chips for the butterscotch chips! As long as the top is covered in chips, anything goes!!! So much goodness going on and that topping! Sharing this on my Facebook page today! 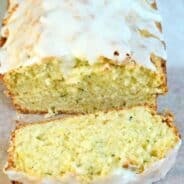 Would this work for mini loaf pans if so how many would this recipe make and how long would you bake them for? thanks! When I make banana bread I have to use two loaf pans. When I bough them I thought they were the big ones. Do you think I should use two for this? Looks so good!